NOT TO BE USED BY WOMEN WHO ARE PREGNANT OR NURSING. SKIN TEST FOR SENSITIVITY TO THE CARDAMOM SPICE OIL PRIOR TO SLATHERING ALL OVER. MAY FEEL WARM UPON YOUR SKIN FOR THE FIRST FEW MINUTES AFTER APPLICATION. A warm candy-like blend of brown sugar, spicy green cardamom pods, Moroccan rose absolute and Bulgarian rose absolute. It is luscious, sweet and very enticing. On initial application, the rose and cardamom are most apparent with the sweet brown sugar beneath. When applied liberally, the cardamom will journey with you for a good 30 minutes to an hour. The rose smells like candied rose petals. It is young and gentle - not at all a matronly rose and not an assertive and overpowering rose. It blends perfectly with the cardamom and brown sugar. After about an hour the brown sugar is predominant, the cardamom has receded and the roses are very subtle and tame. The long term dry down is primarily a sugary, warm, brown candy scent. 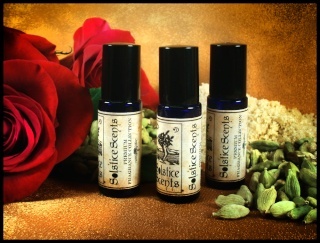 The scent is so divine that you will want to reapply often and breath deeply! Cardamom Rose Sugar is an alluring and romantic scent that smells almost edible. The cardamom is added very liberally to this blend so it does not burn off immediately as a fleeting top note. Skin test for sensitivity prior to slathering all over as cardamom is a spice. It may feel slightly warm upon your skin within the first few minutes of application but you should notice this sensation dissipates very quickly. If you are very sensitive, discontinue use. If you're not, slather it all over your arm liberally and try not to eat yourself! If you like the brown sugary tone in Blueberry Brown Sugar Muffin Batter and the Winter Scent Sugarvale, you'll love Cardamom Rose Sugar! I received this yesterday. I love the inital heavy cardamon scent,w hich is why I ordered this. It does dry down to a very warm sugary scent, which I don't love as much. The scent description is right on, and I guess I was focused on the cardamon notes, and ignored the rest. It overall is a bit too sugary for me, but I will wear it and maybe wear a different lotion or glace with it. Ok, I totally just tried this about an hour ago, but so far I LOVE it! It smells just like liquified Gulab Jamun (an Indian dessert that incorporates these yummy little milky doughnut-like balls with a sugar syrup, cardamom and rosewater).That's what I smelled as soon as I opened the vial, and it was SWOONWORTHY. The rose is indeed quite subtle, and the cardamom fades a little faster than I'd like, but the brown sugar is surprisingly not cloying to me. The other ingredients render it a little more exotic than a basic sugary scent. I could always change my mind later, but my first impressions are very favorable! I have scents where cardamom plays a supporting role, but this is one of the first perfumes I've tried where it's featured as a primary element (and very successfully, too!). There is just enough rose to provide interest, but it's in a supportive role. This is such an incredibly unique blend! I do wish the cardamom stuck around a bit more, but brown sugar lovers will definitely love the finale. I'll be honest about this one, it just doesn't work at all on me. I was hoping for a scent that's stronger on the rose and brown sugar with the cardamom just being used to give a slight spicy kick, but as the oil hit my skin I was attacked by a blast of spices - I really don't like spices! But, I'd read on here that it was all supposed to die down so you end up left with the brown sugar, and so I waited, and waited. The spices continued to take over the scent the entire time and I ended up with such a bad headache I had to wash it off after something like 45mins to an hour. On me, this scent is no rose, a little sugar, and LOTS of headache promoting spices. Had it been more sugary, it may have worked out but, it's just not sweet enough. Plus I was so sad for not feeling any rose! If you're a big fan of spice though, give this a try! You'll probably enjoy it! I love how scents are completely different on everyone! I had the exact opposite experience that Midstar did. I was hoping that the Cardamom would stick around longer, but it only lasted about an hour. After that I was left with the rose and sugar and in the end, just the sugar. I might have liked it more if it wasn't a brown sugar scent, since they tend to go molasses/maple sugar on me. When it's first applied, it's lovely with the spiciness from the Cardamom. I wish it would just stay like that! It will however be great in the shower with the soap! Exactly as Angela described it! I'm re-reviewing this now that my medications are under control and things are smelling normal to me again. The brown sugar isn't amping up like mad on me now and I can smell all of the listed notes, and this is such a beautiful, unusual blend. The brown sugar & cardamom give off an impression of a peppery, resinous, sweet myrrh with a crisp, green edge. I love that this is sweet, spicy, fresh and perfumey all at once. Like an expensive rose oil dribbled over fresh roses and green stems, and then covered with a heavenly mix of brown sugar & cardamom. Very exotic and beautiful. I bought a sample of Cardamom Rose Sugar perfume oil. When wet on my skin, I didn't care for it too much, however, when it dried, I really liked it. At drydown is when I picked up a "green scent," which I guess is the spicy green cardamom that Angela mentions in the scent's description. I love that greenie scent! Also, after drying, I could smell the brown sugar, and it's nice because I don't find it to be overpowering. I bought this sample because the fragrance's description mentions that one of the ingredients is Bulgarian Rose Absolute. I recently read an article (might of been in The Whole Dog Journal, of all places!) that said that Bulgarian Rose Absolute is the only rose scent on the market that provides a true, beautiful rose scent, and it's quite expensive. I note a very subtle rose scent on my skin which is very nice. I agree that this rose fragrance is not at all a "matronly rose scent." That's how most rose scents smell on me, and it's why I tend to shy away from them. This is such a lovely sweet, warm scent! The brown sugar is heavy on me while the rose and cardamom take a back seat. I'm not sure of this scent is coming back into the line up any time soon but if it does, please give it a try. This was one of the first samples I ever got, I was really hoping I would like it but on cold sniff I got a really strong cardamom scent and it was a big no no for me, and I never even tried it on after that. I recently started working at a donut bake shop and we roll our traditional donut in a mix of cardamom and sugar. Long story short: I fell in love with cardamom and gave it another chance, and boy was I glad I did. I still get that strong cardamom smell at first but I don't dislike it anymore. It quickly died down once on my skin and leaves room for a pretty and exotic spicy scent. I joke at work saying that it makes me smell like "a pretty sugar munkki" (munkki is the finish word for donut) I do wish it would last a tad longer on me, but I really don't mind reapplying, since I really enjoy experiencing it over and over again. It doesn't completely fade away on me, but after a couple of hours I am left with a much sweeter smell lingering closer to my skin. I enjoyed it so much that I decided to purchase a full sized perfume. Thanks Angela for keeping me surprised and falling in love even between orders. Very cardamom-heavy when first applied, I get very little rose from this overall. I'm not a rose lover at all, but I was hoping this might help to change my mind, so I'm only slightly disappointed over it in the most confusing way. After an hour or so this dries down to... pancakes with maple syrup? I'm sure that's the brown sugar and nothing else. It's lovely, especially if you want to smell like real syrup! Sadly for me I've had too much maple bacon in my life to like maple much anymore, but I still don't hate it. And it's always nice for a winter day when I need something sweet and comforting! In the bottle this smells strong and very spicy. On the skin it is a bit different. On application the rose is the most prominent note. Don’t let the rose note scare you, it is sweet a sweet, gourmand note and not at all powdery or heady. As it develops it begins to smell like rosewater syrup, cardamom, and brown sugar. It reminds me of a cross between baklava and a cardamom roll, but without the bread pastry note. After a few hours it fades into a cardamom and brown sugar scent, which does smell a bit like maple syrup on my skin. This is one of the most unique gourmands I’ve tried and I absolutely adore it. This is one of my favorite perfumes. I've not found anything out there that's similar, and few gourmands are as yummy as CRS. I completely agree with Liber in saying that this is pretty much liquefied gulab jamun. And that is such a good thing! It starts out with a super strong and fresh cardamom backed by young rose petals and a dusting of sugar. Angela's description is spot on regarding the rose note. I usually hate florals, but she's the only one who can consistently make me love them, particularly rose. It smells like the scent of real, pink rose blooms on the wind, not overbearing in the least. If you don't like cardamom, you will not like this scent. Period. Personally I could huff cardamom pods in my hands all day, so if you're in the same boat then you'll adore this. The cardamom feels refreshing and brings an energy to what would otherwise be a lovely, if more generic, sweetened rose blend. It does burn off over time; for me it's usually gone in about 40 min and I'm left with a droolworthy, syrupy rose and brown sugar. CRS is very cuddly and sensual, but it also makes me feel confident in my own skin. I think an adventurous princess would smell like this. She might like fancy clothes and the finer things in life, but she'll jump into action just as easily. What a gorgeous scent! The cardamom is very strong on me for the first hour and then some, which I love. It smells like a sweet, spicy chai tea latte tastes. It's spicy & warm with the cardamom on center stage, but then softens with a very well blended rose and sugar. I tend not to like florals, at all, but this one is more sweet & spicy than floral. In fact, it is difficult for me to isolate the rose. Although it leans fall, I think it's something I could wear all year because it doesn't go sickly sweet in the Florida heat like other sugar scents can do. The spice keeps the sugar in check. I can't wait to try the SS Sycamore chai scent!